Spacesuits, much like spaceships, are an enduring symbol of the thrill of exploration—and as such have received extensive and, at times, fantastical treatment in popular media. Today’s entrepreneurial space movement represents a unique opportunity for fantasy to inform reality. After all, an exciting (and sometimes overlooked) aspect of the rise of commercial human spaceflight is the emergence of new, decidedly-sci-fi spacesuits. Private launch companies SpaceX and Boeing will begin sending humans to orbit in 2018 as part of their respective Commercial Crew Transportation Capabilities contracts with NASA. Meeting this major milestone will open the door for commercial passengers shortly thereafter. In preparation for this “aggressive timeline,” the companies have been hard at work designing, developing, and testing new spacesuits for their commercial astronauts. While these proprietary suits are a tantalizing taste of the future of human spaceflight, major gaps remain in the industry’s preparedness for deep space exploration—and in these gaps, opportunities for new entrants (and investors) in the commercial space suit market. SpaceX’s commercial crew finally gets a uniform as Musk unveils Dragon-specific spacesuit. SpaceX’s new suit will also draw inevitable comparison to another private launch provider’s uniform: the Boeing Blue suit, first revealed in January of 2017. Both suits are intravehicular activity (IVA) suits,meaning they are designed exclusively for use inside a spacecraft—they would offer little protection to astronauts in the expanse of outer space. Both suits are pressure suits, which protect the human body in the unlikely event that the spacecraft becomes depressurized in transit. Beyond these essential similarities, each company has obviously made an effort to visually distinguish themselves—Boeing, from NASA’s current IVA suit (the Advanced Crew Escape Suit, or ACES), and SpaceX from both Boeing and NASA. The look of these suits is essential for each company’s brand identity and consumer appeal within the growing Launchers & Landers market segment—a stark reminder that while SpaceX, Boeing, and others are advancing U.S. launch capabilities, they are also private enterprises competing for customers. When he posted a picture of the new Dragon spacesuit to Instagram last week, Elon Musk alluded to the challenges faced by spacesuit designers hoping to differentiate their product: “Was incredibly hard to balance esthetics and function. Easy to do either separately.” No matter how “space-age” and—let’s be blunt—cool the launch companies’ new suits may look, they must first serve a single, fundamental purpose: protecting the wearers in transit aboard proprietary spacecraft. Private launch providers have their suits lined up for next year’s missions—but these IVA suits are only part of the spacesuit picture. The excitement surrounding SpaceX’s new IVA suit is well-deserved; a signal that the private launch provider is moving ever-closer to next year’s crewed missions. It’s also important, however, to have a clear understanding of the role these suits will play within the broader In-space Biosphere market segment. There are, essentially, three distinct types of space attire: the aforementioned IVA suits; the more-complicated extravehicular activity (EVA) suits; and the elusive environmental or planetary suits. As described above, an IVA suit is to be worn exclusively inside a spacecraft—during transit in a vehicle. An IVA’s main protective function is to become, and remain, pressurized during a depressurization event, thereby preserving the wearer’s biological systems while the vehicle returns to a habitable state. Given their limited protective capacity and simpler design, IVA suits are the least-expensive type of spacesuit currently on the market: as a benchmark, NASA’s ACES full-pressure suit costs about $180k per unit (Anderson et al. 12). IVA suits are also seen as a relatively “disposable” technology—each suit is generally custom-fitted and worn only once, and retired after a mission (28). While it’s true that IVA suits represent the highest volume of spacesuits purchases, they do not constitute a major driver of market value: According to a market report compiled by Space Angels in July of 2016, “over 90% of the market value is attributable to EVA suits” (4). This is due in part to a single EVA suit’s high cost—around $12 million a suit (1)—and to the prevalence of suit component manufacturing (16). 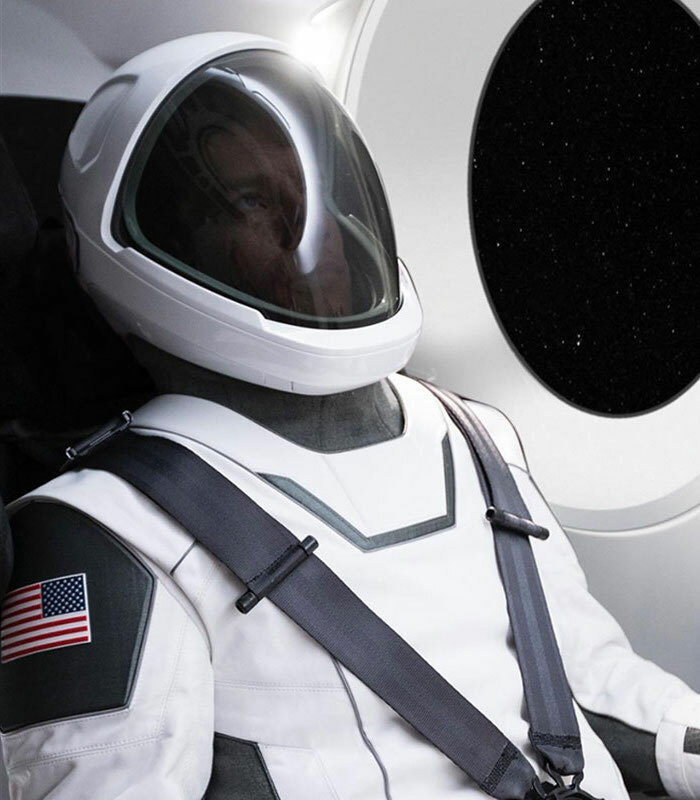 This is all to say that their new duds are not going to be a money spinner for either SpaceX or Boeing—but the new IVA suits are crucial to the safety of commercial passengers and pilots. For their part, SpaceX has vertically integrated the design and manufacture of their IVA suit, thereby enabling the company to effectively scale production and control costs (16). Boeing has taken a different approach to the development of their Boeing Blue IVA suits by purchasing the suits from incumbent spacesuit manufacturer David Clark (23). This effectively reduces development risk (2), but could also lead to higher suit cost depending on manufacturing margins. In many ways, it makes sense for IVA suits to be made by the vehicle manufacturer and operator—especially since IVA suits must maintain an intimate connection with the vehicle at all times. 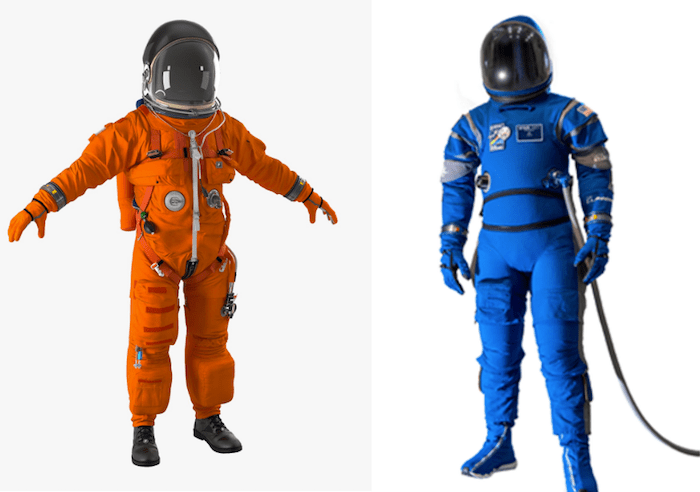 Today’s IVA suits, like NASA’s Modified ACES, are integrated with vehicle life support systems, and next-gen spacesuits will feature advanced ship-to-suit connectivity and and other hardware/software integration (19-20). This human-suit-ship interfacing will ensure that wearers are kept alive and comfortable. However, this preference for vehicle-specific suiting does not extend to EVA suits, of which there is currently a massive shortage and not much of a plan to fill the gap. The EVA spacesuit shortage represents an opportunity for savvy private ventures to demonstrate their value to the space industry. While IVA suits lend themselves to in-house manufacturing by private launch companies, the high cost and complicated mechanics of EVA suits have made them a harder segment for new ventures to penetrate. Due to these challenges and a lack of competition, EVA suits tend to have very long design lifecycles with only incremental advances in innovation. For reference, astronauts aboard the ISS are still wearing EVA suits first introduced in the early 1980s—suits which currently cost NASA an estimated $80 million in annual maintenance costs (11). EVA suits in particular tend to be produced through component manufacturing—a process wherein multiple contractors focus on developing suit components according to their strengths and expertise (16). Historically, a handful of commercial enterprises have been contracted by NASA and other government agencies in order to manufacture EVA spacesuit components—among them ILC Dover, David Clark, and Oceaneering. These incumbent manufacturers have several advantages over emerging ventures: established safety records, longstanding customer relationships, and a demonstrated expertise of critical technologies (Anderson et al. 1). Where these big players can falter, however, is in the face of agile new entrants—especially those with potentially disruptive technology or innovations. Once such new entrant is Final Frontier Design (FFD), a Brooklyn-based space startup that has created “a number of EVA suit components for NASA” since its founding in 2010 (14). While FFD is designing full-body suiting options, one of the company’s most exciting offerings may be its unique mechanical counter-pressure (MCP) gloves for EVA suits. 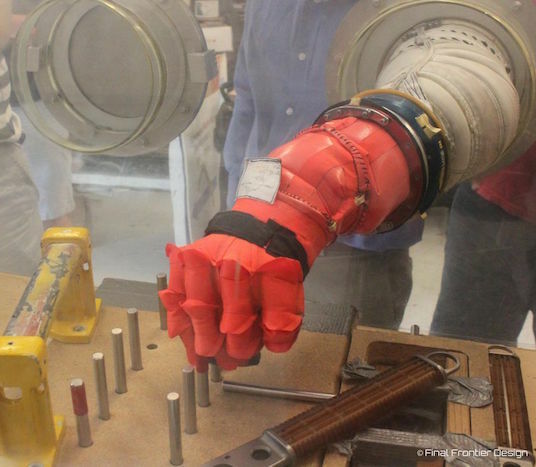 The gloves, which earned FFD a fixed-price contract with NASA in 2015, provide wearers with increased finger mobility over current gloves while decreasing bulk and weight—critical accommodations for precision and dexterity in the vacuum of space. It is precisely this type of innovation that can give small companies a competitive edge among well-established spacesuit manufacturers—especially with NASA as a captive audience. As competition between private launch providers and commercial space operations heats up, demand for cutting-edge EVA suit technology can be expected to keep pace. In a July 2016 interview with Space Angels, FFD President Ted Southern highlighted the economic potential of EVA suit design and manufacturing: “The IVA suit market represents a very...limited market. EVA represents a much larger market, both short term and especially longer term” (4). According to our market analysis, there are three critical dependencies which must be met in order to successfully commercialize next-generation spacesuits: 1) the development of advanced materials; 2) acceptance by both government and commercial customers; and 3) barriers to adoption for competitors (18). In recent years, we have witnessed progress towards each of these dependencies. Given the right conditions and maneuvers, even a small startup venture can have an indelible impact on today’s space economy. Read more about segmenting the space economy. A unique confluence of market forces sets up huge potential for enterprising spacesuit entrepreneurs. We are living in extraordinary times. There has never been more activity or investment in the entrepreneurial space industry. At the same time, the watchful public has come to anticipate a certain level of innovation and forward momentum from today’s big-name space companies. Front-and-center of the cultural moment are private spaceflight ventures like SpaceX, Boeing and Blue Origin—each of whom is designing their own iconography and establishing their branding ecosystems. But these large brands do not operate in a vacuum (well, except the literal vacuum of outer space). SpaceX and its competitors represent a facet of today’s space industry, but other, smaller players are emerging to fill gaps in the market. Startups like Final Frontier Design have identified technological gaps in the evolving spacesuit market left vacant by both incumbent suit manufacturers and vertically-integrated IVA suit operations. 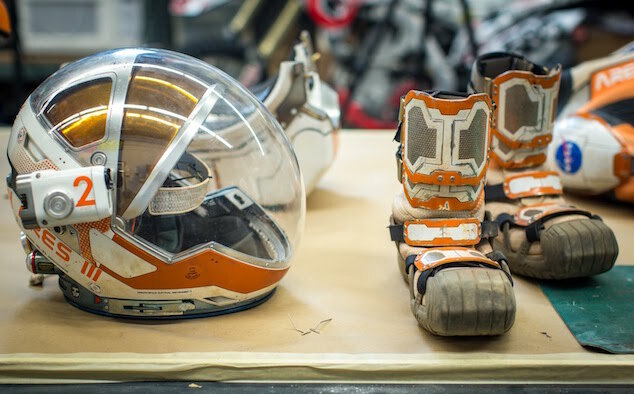 As human spaceflight becomes normalized, and as EVA suits—and one day, on-surface planetary suits—become increasingly in-demand, there is undeniable opportunity for design-oriented engineers and startups to make their mark on the spacesuit industry. There’s never been a better time to get involved in commercial space. If you’re ready to start investing in private space companies, we invite you to apply for membership to Space Angels. Quirk, Chris. Under Pressure: The Past, Present, and Future Market for spacesuits. Ed. Chad Anderson and Ishan Shrestha. Space Angels Network. July 2016. Accessible here.